Flooding and erosion can be controlled through physical barriers erected along the developed riverbanks. In arid areas, check dams can aid in restoring damaged landscapes and retaining soil post rainfall. In the case of construction projects, metal plates can offer support for excavations, retaining permanent foundations, or walls on slopes. The above applications can be tackled by using sheet piles, which are basically elements folded from flat material and pushed vertically inside the ground to stabilize soil and create walls. Soil needs to be properly stabilized for sustainable management of land in various industries like agriculture, mining¸ and construction; and degradation of land is a major catalyst for climate change and is projected to cost around $10 trillion every year across the world. Motivated with these developments, a group of roboticists at Harvard’s Wyss Institute for Biologically Inspired Engineering has created a novel robot that can independently drive interlocking steel sheet piles inside the soil. The structures built by this robot may serve as check dams or retaining walls for erosion control. The forthcoming 2019 IEEE International Conference on Robotics and Automation will feature the researchers’ study. Traditional sheet pile driving processes are known to be highly energy intensive. A downward force is vertically applied by using just a small amount of the weight of standard heavy machinery. On the other hand, the Romu robot developed by the Wyss team is capable of leveraging its own weight to push sheet piles inside the ground. This is viable because all the four wheels of the robot are connected to an individual linear actuator, which also enables it to adjust to uneven terrain and make sure that sheet piles are pushed in a vertical way. From an elevated position, the robot clasps one sheet pile and subsequently lowers its chassis, and while it does so, it presses the sheet pile inside the soil by using an onboard vibratory hammer. When the robot again grips the sheet pile at a higher position and repeats this process, it is able to drive a sheet pile that is relatively taller than its own range of vertical movement. Once the robot has driven the sheet pile to an adequate depth, it advances and drives the next sheet pile in such a way that it interlocks with the earlier one, thus creating a continuous wall. When the robot has used up all the sheet piles carried by it, it then goes back to a supply cache to restock. The project was based on an earlier work carried out at the Wyss Institute on swarms or teams of robots for use in construction. In a study inspired by mound-constructing termites, Radhika Nagpal, a key faculty member and Fred Kavli Professor of Computer Science at the School of Engineering and Applied Sciences (SEAS), and Justin Werfel, a senior research scientist, developed an autonomous robotic construction crew known as TERMES, the members of which work together to construct intricate structures from specialized bricks. Along with researcher Nathan Melenbrink, Werfel performed an additional study to explore strut-climbing robots that have the potential to construct cantilevering truss structures to deal with bridges and similar applications. Yet, these studies were not able to address the difficulty associated with the fastening of structures into the ground. The Romu project was originally started as an exploration of techniques for installation of foundations and automated site preparation for the previous systems to build on; however, as it progressed, the researchers found out that such kinds of interventions may also be directly relevant to land restoration work in remote settings. 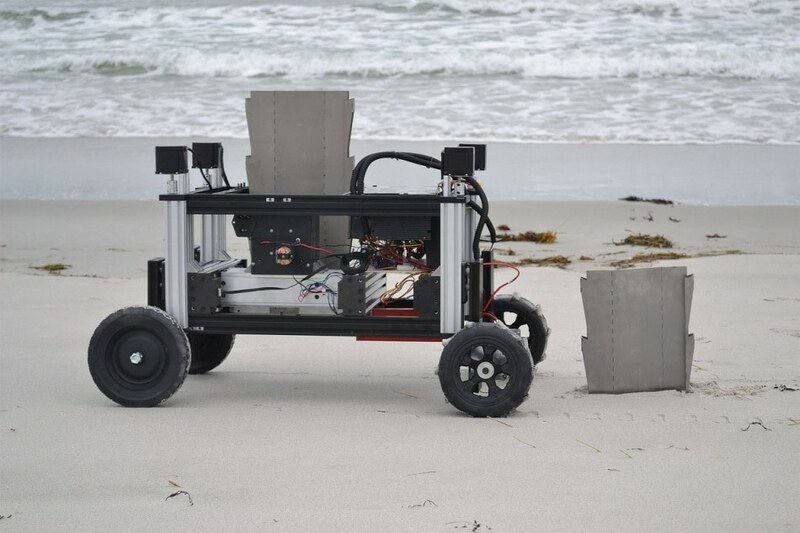 In addition to tests in the lab, we demonstrated Romu operating on a nearby beach. This kind of demonstration can be an icebreaker for a broader conversation around opportunities for automation in construction and land management. We’re interested in engaging with experts in related fields who might see potential benefit for the kind of automated interventions we’re developing. Nathan Melenbrink, Researcher, Wyss Institute for Biologically Inspired Engineering, Harvard University. The investigators foresee a huge number of Romu robots operating together as a swarm or team. In computer simulations, the team showed how swarms of Romu robots can leverage environmental cues, for example, slope steepness so as construct walls in different locations, thus using the limited resources in an efficient manner. The swarm approach gives advantages like speed-up through parallelism, robustness to the loss of individual robots, and scalability for large teams. By responding in real time to the conditions they actually encounter as they work, the robots can adapt to unexpected or changing situations without needing to rely on a lot of supporting infrastructure for abilities like site surveying, communication, or localization. Justin Werfel, Senior Research Scientist, Wyss Institute for Biologically Inspired Engineering, Harvard University. The name Terramanus ferromurus (Romu) is a nod to the concept of ‘machine ecology,’ in which autonomous systems can be introduced into natural environments as new participants, taking specific actions to complement and promote human environmental stewardship. In the days to come, the Terramanus “genus” can possibly be extended by more robots performing various tasks to restore or safeguard ecosystem services, which the ecosystems indirectly or directly contribute to the well-being of humans. On the basis of their findings, the researchers are currently keen on studying interventions spanning from the construction of responsive flood-barrier for hurricane preparedness to groundwater retention structures for assisting agriculture in arid regions. Upcoming robotic versions may execute other interventions, like installing silt fencing or spraying soil-binding agents, so that a range of these robots can possibly act to stabilize soil in many different settings.